THE PASSIONATE PRO-LIFER TURNED ABOLITIONIST: Countering Keyes ? Let me offer this reply to Alan Keyes' excellent exposition, in rebuttal. a great master. Yet, only Nixon could go to China; strange things happen. it is offered, with malice towards none, and I look forward to your thoughts. First let me state how much I hold you both in high regard and personal Christian love. Second, let me reply to Alan, to Janet, and along with that reply speak to the Bob Enyart position, and my many friends among them. This letter is directed to you personally, but also to the movement, so I will use appellations. I am an abolitionist. Keyes and Enyart rightly support the moral principle that any law which ends, “and then you can kill the baby” is trespassing “thou shalt not murder”. Keyes makes cogent moral argument for obedient Christian observance, and the Enyart position, that pro-lifers should not rest until complete abolition (from conception) is law, is also correct. 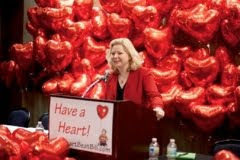 But yes, Janet Porter, you can add my name to the list of support for the heartbeat law. Why? Intellectual dissonance? Moral confusion? Personal compromise? No. First, the law makes it illegal to murder human beings with a detectable heartbeat. It does not legalize whether human beings without a heartbeat may be killed – the federal law does that. The distinction is minor, but the legality of abortion is due to previous court precedent, not this law. This law does not end, “and then you can kill the baby.” Roe v. Wade and the SCOTUS ends that way, and we are all doing all we can to take power from that existing “law”. Yet this is not the thrust of my reply. The crux of Keyes argument is that killing the baby under any circumstances is immoral, contrary to Godly principle, and therefore any law which allows it is also immoral and contrary to Godly principle. Further he argues that the existence of any such law which is less than righteous requirement of God corrupts the hearers, and a moral people advocating such a law are corrupted themselves, both morally and politically. It’s a great argument. I was persuaded by it for a long time. Studying the Holy Bible I have come to see it is slightly inaccurate.